For the Civilization IV-based remake, see Sid Meier's Civilization IV: Colonization. 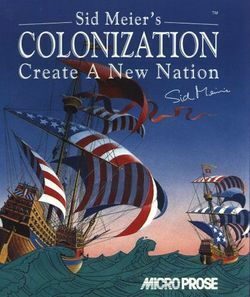 Sid Meier's Colonization is a turn-based strategy game released by Microprose in 1994 for MS-DOS, and for Windows, Amiga, and Mac OS in 1995. As a result of its long-standing popularity with fans, Firaxis Games developed Sid Meier's Civilization IV: Colonization, a standalone remake using the Civilization IV engine, which was released in September 2008. The game is set around the European colonization of the New World, starting in 1492 and lasting until 1850, and covers from the arrival of the first colonists right up to the war of independence. It shares many similarities with Sid Meier's Civilization, which was immensely popular and has many sequels, but it also has some key differences.